First of all, let me make this clear: Star Trek ROCKS. Even the not-so-great movies — Star Trek V: The Final Frontier (1989) and Nemesis (2002) — were still at least mildly entertaining. 2. That said, I absolutely agree with them. What kind of a god would ever demand constant fear from his creations? Certainly not the God I believe in, or His son (Jesus Christ). The Bible (if you give it any credibility) addresses this topic in a very reasonable way: Where God’s love is, there is no fear, because God’s perfect love takes away fear. It is his punishment that makes a person fear. (1 John 4:18). Disappointing Him by failing to constantly strive to be the person He knows I can be. Saddening Him by ignoring the opportunities He gives me to tell others about how He changed my life through Jesus and how their lives can be made better the same way. Insulting Him by living my life as if He doesn’t exist. Belittling Him by not fully acknowledging everything He did for me (and for you, too) by offering the gift of Jesus, who died to make up for the sins of everyone who believes in Him and follows Him. 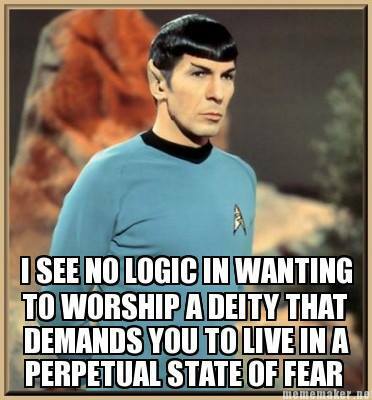 I see logic in wanting to worship a deity like this. Do you? Yes or no, post your thoughts below and let’s have a conversation. There is no love in a relationship where one partner is ‘afraid’ of the other. I do not fear god nor anything else imaginary. When a child is afraid of disappointing their parents, that is not fear. It is uncertainty about disappointing the self. They look up to and seek approval of the parent, failure to do so is self loathing, not fear of reprisal or pain nevermind eternal torture. The comparison between parent/child relations and god/man relations breaks down because no parent would kill ALL their children but YHWH (God) would. Normal parents would not kill even one of their children yet YHWH has demanded that humans do this and was not bothered if humans did. There is no love with YHWH, only fear and compliance. Thanks for your thoughts. Of course, I absolutely disagree with them; in fact, if I believed what you believe, I never would have become a Christian. Please show me where Jesus Christ “demanded” humans kill their children. In addition, please explain the gift of Jesus Christ to anyone and everyone who is willing to accept Him. Hardened atheists may not consider Him a gift; I do because through Him, I’m better able to withstand the challenges of this life and I have real, life-changing hope that this life is NOT all there is to my existence. You believe that JC is YHWH, what YHWH did JC did. The christ is not a gift, prophecies were adjusted to make JC the one. Lies were told. Abraham was told to kill his child. Idiotically he did not say no.Jeptha did it willingly and YHWH accepted it because we know he loves the smell of burning flesh. You have withstood the challenges of life, but not because of JC. If JC were required then atheists would no be able to withstand them. While you may think there is an afterlife, there is no proof of such. So you live your life in hope, like an insurance policy rather than live this life like it is the only one. To you reality is that of invisible make believe friends — but we know that living this way is not good. Of course, if you have credible evidence or proof of your JC, show it because the world wants to know. Atheists are not who you need to convince. To start you need to convince all Christians that there is one god and one way to worship and then you have to convert those that want to believe – Muslims, Jews, and other religions. When you do that I will take notice. Taking a few verses out of the Bible and coming to a conclusion about God is a mistake. God is too big and too complex to be well understood without some serious study. And He has given us the Bible for that purpose. The Bible is spoken of as God`s `love letter`to humanity, and as such, the more that we know about it, the better. The Bible says that fear of God is a healthy thing. Not an unhealthy, paralyzing fear, but a fear which makes us sit up and take notice: “The fear of the Lord is the beginning of wisdom: a good understanding have all they that do his commandments“. Jesus Christ, the Messiah, who was fully divine as well as fully human, did not owe mankind anything. And when the Roman soldiers came to take him away, He could have easily commanded angels to release him. But He didn`t because He loved us so much that He chose to die as the perfect sacrificial Lamb for mankind`s sins. So now the ball`s in our court: Are we going to judge God for being too strict or unloving. Or are we going to believe that God so loved the world that He gave his only begotten Son, that whosoever believeth in Him should not perish but have everlasting life. And to end on a personal note: back in 1985 I broke down in tears, repented of my wickedness, and asked Jesus to forgive my sins. And instantly, and miraculously, He did! Years later, I was baptized in Jesus`Name for the remission of those sins (although I had been forgiven, baptism wiped away the record) and three months later I was filled with the precious gift of the Holy Ghost! It is such a blessing to be able to follow God`s Word without paralyzing fear and to feel His love on a consistent basis! I would just like to leave this here. Also, what makes Christianity the one true religion over all the others in the world? I don’t even know if anyone will read this comment but that is a question for which I have never received a satisfactory or logical answer. It’s NOT terrorism or extortion. That’s propaganda. The truth is, when this life ends, you, me and everyone else must account for the wrong things we’ve done and the right things we’ve failed to do. If you think you can pull that off to God’s satisfaction, without having Jesus at your side, then good for you. I know I can’t. I hope and pray that you are serious about wanting an answer and will check out the link. I love how you have compared God to the love of a good parent. If we didn’t love our children, we would not care how they grew up into adults. God cares. Always has and always will. And, I know my God loves His children beyond measure as He sent His precious Son to take on our sins and die in our place.